Fans of Hawaiian koa will love the look, feel and sound of this all-koa Grand Auditorium. A shaded edgeburst elevates the vintage appeal of the solid koa top, which is paired with layered koa back and sides, while a gloss finish wraps the body in a rich sheen. 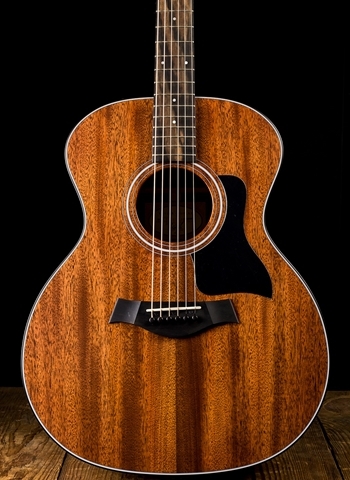 The Grand Auditorium’s musical versatility makes this a great all-purpose guitar for both strumming and fingerpicking, and the hardwood koa top will even out a lively attack to produce a focused, linear voice. 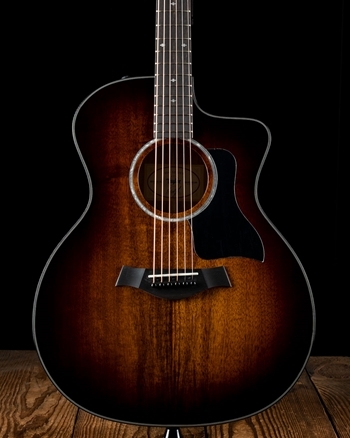 Player-friendly modern features include a cutaway and Taylor’s ES2 acoustic electronics. Among the distinctive appointments are a single-ring faux pearl rosette in an interlocking "fishbone" pattern, black binding, Italian acrylic small diamond inlays, and chrome tuners. The guitar ships in a Taylor deluxe hardshell case.